I am new to Adobe Illustrator. I created a few actions by recording. Somewhy when I record the action Reflect in vertical, AI adds strange parameters Origin DX and Origin DY with some values. So when I use this action, my object together with reflecting jumps far away, which is very uncomfortable. I want to reflect on the same place. But I cannot delete these Origin DX and Origin DY by clicking the trash icon, it does nothing. And I tried to record this action again several times, it always adds Origin DX and Origin DY. How can I avoid them or delete them? In order to rotate or reflect any object - any reflection/rotation - there must be an origin -- a point that is seen as the "pivot point" where the center of the reflection/rotation resides. It is illogical, if not impossible, to want a rotation/reflection without an origin point. You can't remove the origins. Not having them would not allow any reflection/rotation. You should be able to use relative positioning, i.e. "flip horizontal/vertical" which would reflect using the center of the object as the relative origin. It depends a bit on specifically how you are rotating/reflecting. If an object is selected on the artboard, double-clicking the Rotation or Reflection tool will open a pop up dialog. Simply input the desired change there and click OK. That will use the center of the object as the origin point. -- You could also merely alter values on the Transform Panel or Control Bar. I believe it's only when using the tools to "click" and set a point of origin that the origin is recorded into an action. Using the dialogs boxes or panels won't record a point of origin specifically. Not the answer you're looking for? 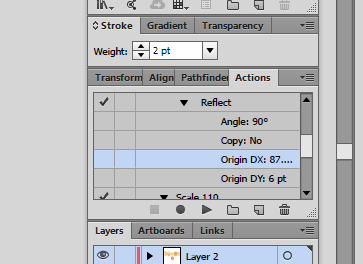 Browse other questions tagged adobe-illustrator actions or ask your own question. How do I make a photoshop action pick a color from the image?